Author: Yukihiro Nakanishi M.D., Ph.D. Cite this page: Nakanishi Y. Epidermoid metaplasia. PathologyOutlines.com website. http://www.pathologyoutlines.com/topic/esophagusepidermization.html. Accessed April 20th, 2019. Contributed by Yukihiro Nakanishi, M.D., Ph.D. Which of the following statements about epidermization / epidermoid metaplasia of the esophagus is false? C. PAS stain shows reduced expression of PAS+ cells compared with normal squamous epithelium, leading to Lugol voiding lesion with clear demarcation, resembling superficial esophageal cancer. Which of the following statements about histologic features of epidermization / epidermoid metaplasia of the esophagus is true? 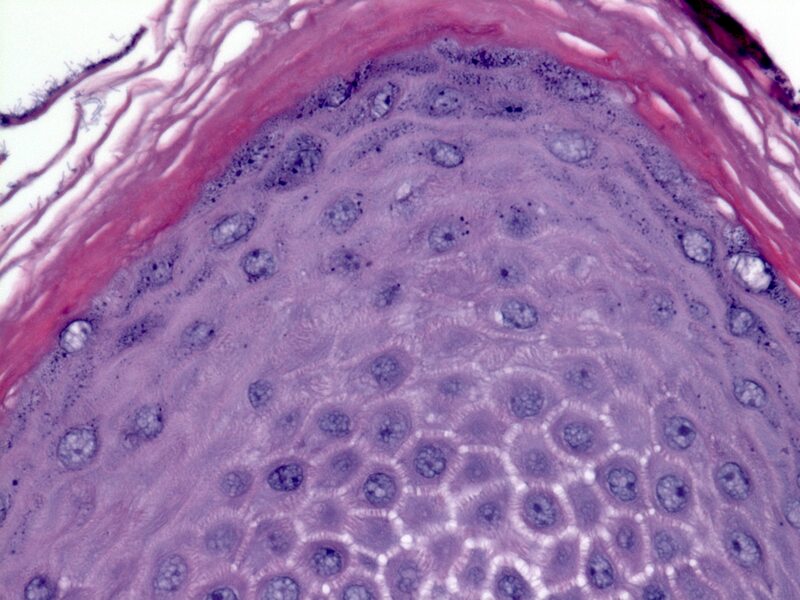 C. Epidermization / epidermoid metaplasia is histopathologically characterized by the presence of the granular layer beneath the cornified layer. 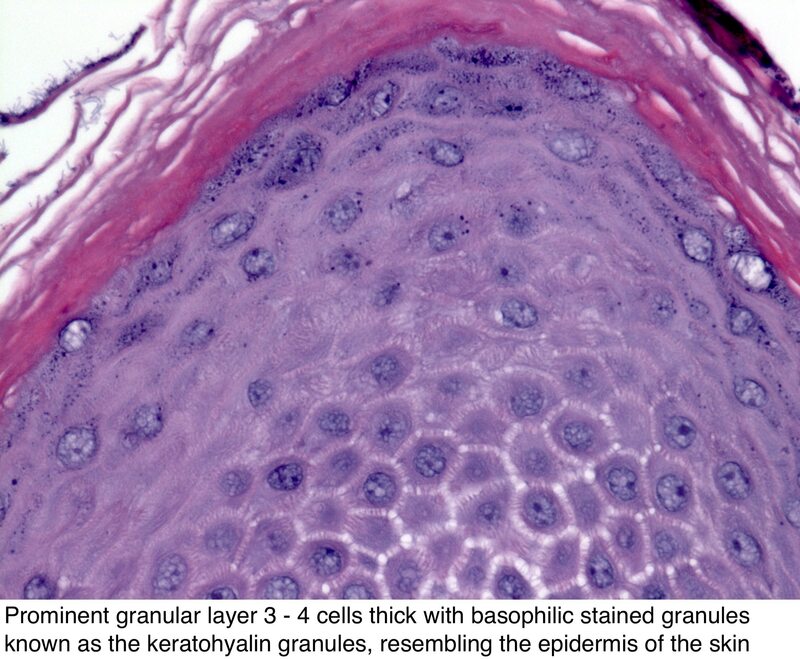 The granular layer contains basophilic stained granules known as keratohyalin granules. 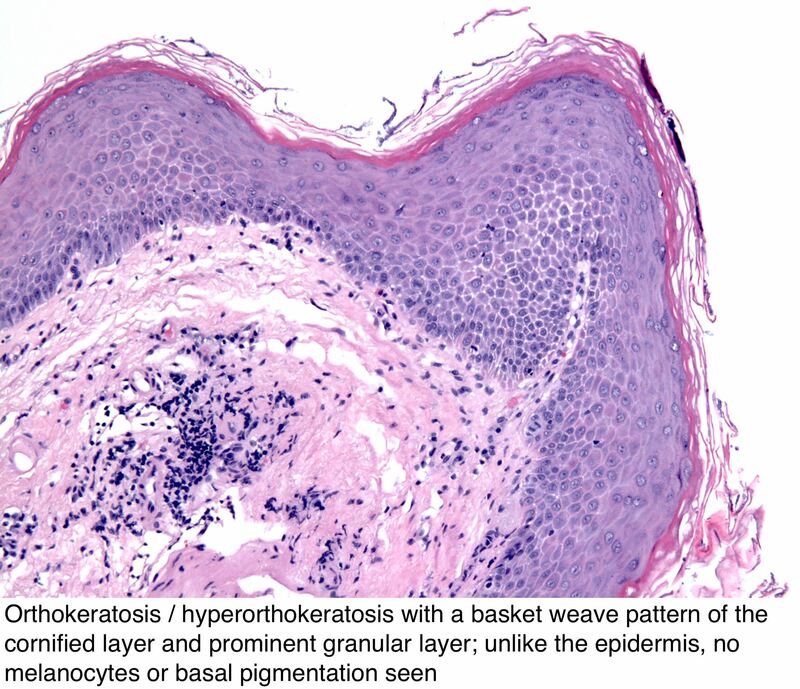 Parakeratosis is characterized by keratosis with persistence of the cell nuclei. The stratum lucidum is seen only in soles and palms and is not seen in epidermization / epidermoid metaplasia. Parakeratosis is more frequently seen in the esophagus than orthokeratosis / hyperkeratosis.